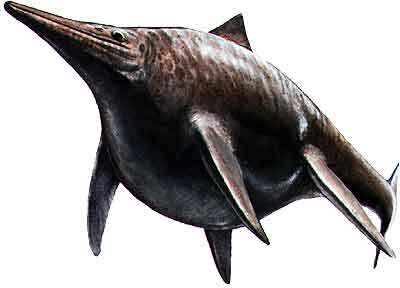 Shonisaurus, found mostly in the Shoshone Mountains in Nevada , Shonisaurus was a swimming fish somewhat like today’s dolphin. This dinosaur was from Ichthyosaur group (means fish lizards). There were about 10 in total of this group and Shonisaurus was the biggest. It has the length of 50 feet which is one big dolphin, that’s for sure. There is a rumor of one being found even bigger at 69 feet in length. It was told to be found in a remote river bank in Canada . This information was not made very public so scientists are not sure if it’s true. The fossils were never released.